Learning the basics of how to fly fish is easy, mastering these techniques is a lifetime journey that is exciting, fun and challenging. Fly fishing has been a popular pastime for hundreds, if not thousands of years. Origins can be traced back to England where a few old books were published on fishing techniques. One of the authors was a fishing companion to William Shakespeare. The earliest US settlers brought fly fishing with them, and the sport has continued to grow in popularity. Fly fishing is a very different technique than more traditional bait and float techniques. To get started fly fishing, you’ll need some basic gear. We don’t recommend putting a lot of money into your gear at first, but we also don’t recommend buying the most inexpensive gear either. Good medium grade gear is great to start off with and will help your entry into the sport be more enjoyable. Cheap gear can literally ruin your experience. The fly rod is the core component to your fishing experience. Today’s rods are made of strong, durable, lightweight and accurate materials (commonly Graphite). There are three primary aspects you’ll need to consider when looking for a rod: length, line weight, and action. Length – Rod length is typically 7 -10 feet, and driven by the type of fish you’re after, and the environment you’ll be fishing in. For example, if you’re fishing for trout in the Great Smoky Mountains National Park, you’ll want a 7-8 foot Rod. But if you’re on a beach fishing in salt water, a longer 10 or 11 foot rod will be better. Line Weight – Line weight is driven by the type of fly you’ll be using, the presentation of the fly you’re after (how the fly lands on the water for the fish), and casting distance desired. Action – Action determines how much the rod will bend at the tip. Fast action rods use a larger portion of the tip to accelerate the line more. Slow action rods, cause more bend, but use less of the tip, offering a more delicate presentation of the fly. Our Recommendation: We recommend an 8-9 foot 5 weight to start off with. The length and weight is the perfect general purpose fly rod, and ideal for fishing trout. Reels are designed to hold your line and provide resistance against the fish when it bites and swims away. We recommend that beginners avoid the intro level plastic reels that are not durable. Instead purchase an aluminum reel, which will cost more but is worth the extra money. Larger arbors (the round part of the reel) are nice, as they provide less rotations when pulling in your line. 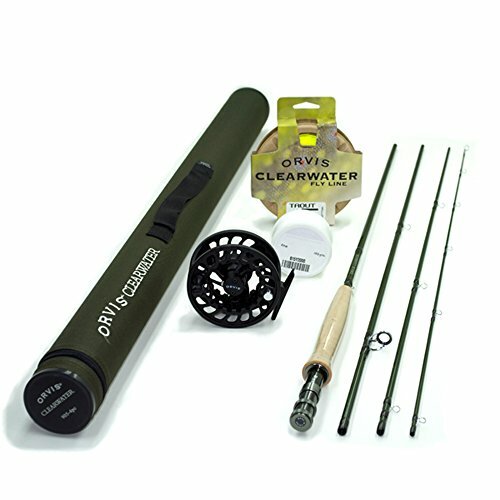 The best deal when purchasing your gear is to but a “Fly Rod Outfit”, which generally includes a rod, reel, and carrying case for your rod. By purchasing both items together in a “combo”, you get matching equipment at a discounted price. Fly fishing line is a little more complex than traditional fishing line, and is made of of separate sections. The backing, the fly line, the leader, and the tippet. We’ll discuss the purpose of each of these sections below. It adds line to your arbor (the part of the Reel that holds the line). This makes it easier to reel in your fly line and additional adds weight to your reel which helps with rod balance and provides for longer casts. Provides additional length for when fish make longer runs. A typical fly line is about 90′, so if a fish decides to run further than that, backing gives you the extra length. Most experienced anglers spool their reel with as much backing as possible, so that when the backing and fly line are combined, they fill the reel. But, keep the type of fish you are after in mind as well. For example, a trout typically isn’t going take a few hundred feed of line during a fight and frankly most good trout streams don’t offer that much space anyway. We would recommend using about 100 yards of backing on your reel/arbor with a 5 weight fly line. Also, be sure to look up the manufacturers recommended line capacity, and don’t exceed this. With traditional fishing, a weight towards the end of the thin fishing line, pulls the line off the reel and out into the water. Fly Fishing, the line itself is weighted, and carries the fly to it’s destination. The weight of line used, and the way you cast the line “presents” the fly to the fish (called presentation). The catch the type of fish you’re after, you must present the fly the way the fish expect it. The combination of rod, line and fly do that. Weight/Length – Fly line is generally 90 or more feet in length, and it’s weight is consistent throughout it’s length. But the actual weight number (1-15) is determined by the first 30 feet. Line weight must match rod weight. Color – This is really a personal choice. Some prefer brightly colored line so they can see the line while casting and in the water. Others prefer colors that blend, so that it’s difficult to see, especially for the fish. There have been numerous done, and most scientists agree that fish can see basic color. The choice is really up to you. Taper – The outside dimensions of fly line is called taper. Taper drives how the line casts and how the line presents the fly to the fish. The various tapers are: Level (L), Weight Forward (WF), Double Taper (DT), Shooting Taper (ST). The majority of fly lines use a WF taper. Fly lines are constructed with small air bubbles to allow them to float. By combining all of these various aspects, manufacturers can make lots of different types of fly fishing line that perform well in many different conditions, and appeal to many different fishing styles and people. Just remember, the most import aspect is matching your line weight to your rod’s weight. So far, we’ve discussed the Fly Rod, the Fly Reel and the fly line. But what actually connects the fly to all this? This is the role of the leader and the tippet. The Leader is a micro-filament line that attaches to the heavier fly line. Without the leader, the heavier fly line would “slap” on the water and scare the fish, rather than presenting the fly. The leader along with the fly line allows the fly to be cast at a distance, yet presented in a way as to not scare the fish, and without the line being seen. The leader provides an invisible transition from the fly line to the fly in the water. The leader is generally about 9 foot long. The leader also serves the purpose of transferring the energy of the cast through the fly line to the fly for better presentation. The leader is typically almost as thick as your fly line at the top, but tapers down in weight and thickness to where the tippet attaches. So what is a tippet? The tippet attaches to the thin end of the leader, and the fly attaches to the other end of the tippet. You’ll need to use different tippets, depending on the type of fish you are after. The trick is the use the strongest yet lightest tippet you can to present the fly so the fish cannot see the tippet at all. For typical stream/creek fishing, you’ll want to use either 4x or 5x tippet. 4x works very well for trout. Determining which fly fishing flies to purchase and use can often be a bit overwhelming. There seems to multiple versions of flies for literally every bug in existance! While fly selection seems a bit overwhelming, fortunately it isn’t. Most flies are just variations of a few common types. The really good news? You don’t have to be exact, and getting close to the right overall design and look works just fine. These float on the surface and mimic the adult stage of an insect. The various patterns are designed to mimic the types of insects in the area you’ll be fishing, so you can target the types of bugs the local fish are used to and eat. Dry flies often have attractors as well, designed to (as you would guess) attract the fish. A local fly fishing shop or fly fishing expert can often be invaluable for helping you to choose the right dry fly based on where and what you are fishing. These are fishing flies are designed to mimic a developing insect in it’s larvae stage. These flies stay below the surface. When fish aren’t hitting on dry flies, be sure to try nymph flies, as nymphs are what fish typically eat and almost a sure bet when fishing. These imitate small fish or other aquatic life that fish eat, like leeches. These are sometimes called lures by some fisherman. Streamers can be highly effective at attracting and catching large fish in deep pools. You’ll want to be sure to have a few varieties of these on hand at all times. Clinch Knot – Tippet to fly – You’ll use this one a lot, so memorize it. Scientific Anglers has a great knots page with instructions and clear illustrations. I would also recommend picking up a good pocket sized fishing knots guide to carry along with you. Finally! Time to cast your first fly and begin your fly fishing adventure! Casting is the essence of fly fishing, and while not terribly difficult, it does take practice and experience. The best way to learn how to cast is to cast! The Roll Cast – This is the most basic cast and the one we suggest beginners start off using. The Overhead Cast – Another basic cast, that is ideal for more windy conditions. The roll cast is not only a great way to learn how to cast when fly fishing, but it’s also a great cast for experts to use when there are objects behind you. It’s ideal for fishing on creeks or streams, and is also a stealth cast, allowing you to present the fly without the fish noticing. Stand up current, and let out some line. About a rod’s length, or a little longer. Hold the rod at waist level and lift the road up to the 1 o’clock position – slightly behind your head. The Fly Road and Fly Line should make a D shaped loop behind you. Perform a hard forward cast in the direction you want to go. Here’s a great video that shows you exactly how to roll cast. I really like this video as it shows all the essentials, and does so multiple times, and as slowly as possible. Probably the most common Fly Fishing cast, the Overhead Cast is powerful and excellent to use when you need more distance and don’t have any objects behind you. Grip the road, and place your thumb pointing towards the end of the rod on top. This is critical to achieving a great cast and for getting power. Let out about a rod’s length of line or a little longer, depending on your preference. Place the rod at about waist level, pointed in the direct. The rod should be angled down towards the water, but not touching the water. Slowly lift the rod up to pull the line off the water. This needs to be done slowly to avoid scaring the fish. Once you reach the 10 o’clock position, accelerate your movement until you reach the 1:00 position. Then quickly stop. Be sure your wrist is straight and not bent. Pause very shortly, to allow the line to get behind you. The amount of pause depends on the line, but it’s very brief. Then cast hard forward in the direction you want the line to go. If you’ve made it this far, you officially know How to Fly Fish. You’re familiar with all the basics, and have the basic gear needed. But this is only the beginning of your adventure. Next you’ll want to get out there and begin fly fishing. This is where the real adventure and learning begins. The more you fish, the more you’ll learn. If you’re like us, you’ll learn more what not to do, than what to do at first. You’ll get tangled in trees, your knots will come loose, you’ll loose your flies, and you might even accidentally cast your rod instead of the line! But don’t get frustrated, it’s all part of the learning process we all go through. While fly fishing, make sure you take time to enjoy your surroundings. Listen the wind, hear the water, smell the trees and enjoy the peace and serenity of the outdoors around you. The experience of fly fishing is just as important as the process of fly fishing! As you continue your adventure, you’ll learn about additional gear your might need or want. You’ll probably realize that having more than just one rod has advantages, and you’ll learn to seek out and find optimal spots to fish in. Welcome to Fly Fishing and the journey to master it!